Another award winner from the editors of Cook’s Illustrated Magazine. As with the other books in the Best Recipe Series, all of the dishes in The Quick Recipe are tested more times than one can imagine, with all of the expertise and knowledge of the skilled editors of the much trusted and beloved magazine. 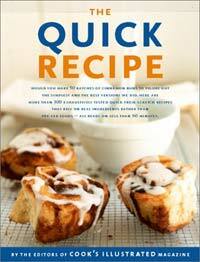 The detailed research and meticulous instructions are all here, making The Quick Recipe an ideal book for the perfectionist wanting to get dinner on the table in under 60 minutes.